The Breda M1931 Heavy Machine Gun (full official designation: ‘Mitragliatrice Antiaerea “Breda” calibro 13.2mm Tipo R. Marina’), was developed upon a request from the Italian Navy issued in 1929. The ‘Regia Marina’ needed weapons for close anti-aircraft defense of its light naval vessels (i.e. MAS fast boats) and some new submarines. Earlier, the Italian Navy purchased a number of French-made 13.2mm Hotchkiss heavy machine guns for anti-aircraft use, but a domestically manufactured gun was more preferable for obvious reasons. Deliveries to Italian Navy commenced in 1932. However Il Duce’s Army and Air Force showed little interest in this gun, preferring the more effective but also heavier 20mm automatic anti-aircraft cannons. 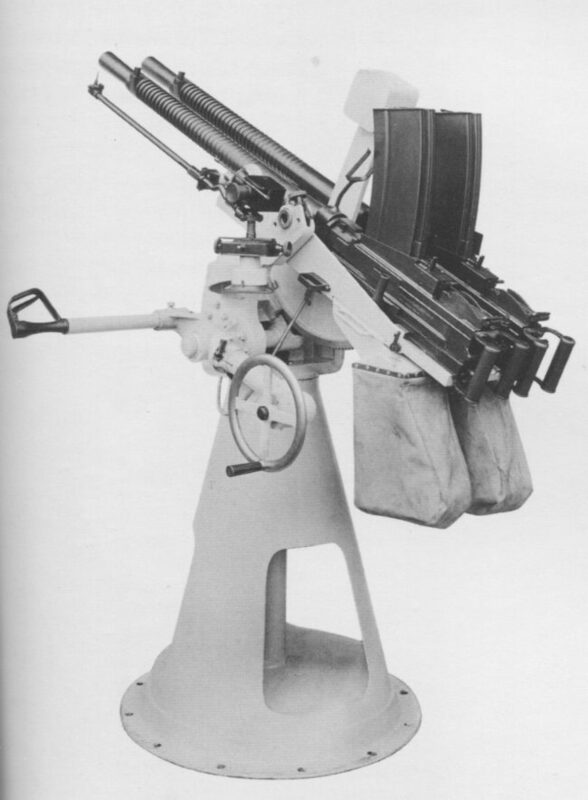 Some of the 13.2mm Breda M31 machine guns were fitted to L3 tanks, sold by Italy to Brazil. Starting in 1942, several Italian armored vehicles also received Breda M1931 heavy machine guns for AA use. The Breda M1931 machine gun was a gas operated, air cooled weapon with a quick-change barrel of heavy profile. The long stroke gas piston is located below the barrel, and the gas system has a manual gas regulator. Barrel locking is provided by a vertically sliding locking piece located at the top of the bolt. This gun fires from the open bolt, and in full automatic mode only. It is fed from top mounted detachable box magazines, with a capacity of 20 or 30 rounds. Firing controls include dual spade grips with a thumb trigger in between, and a manual safety. Firing is in automatic mode only. The standard mountings were single or dual Naval AA mounts of various designs, or vehicle installations. Breda also offered several mounts for ground applications (infantry support and/or AA), but apparently none saw any significant use.